The form and substance. 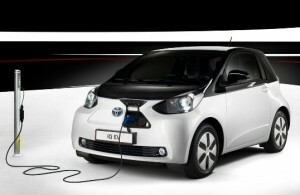 The form, it is the exposure of Porte de Versailles of an electrified the small iQ supermini version. 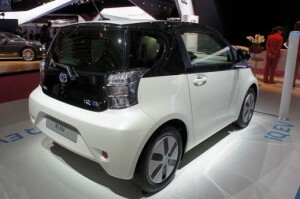 Basically, it is more a presentation form when we know that the Japanese giant’s ambitions are to primarily focus on hybrid and hybrid solutions rechargeable, latter replying “better than a model all-electric to the needs of a majority of customers, in the short and medium terms”. Heavier and longer than its counterpart thermal, Toyota iQ EV is therefore targeted immediately (well, for now) for a career high confidential career should start before the end of the year in Japan against a ticket set at around 3.6 million yen or about 36 000. In Europe, for example, we do not know yet possible release date and consequently much less price. On a technical level, the iQ EV series combines an electric motor/generator 64 hp (47 kW) and 163 Nm air-cooled engine (housed in a new box bridge), a battery pack of 150 items, 12.0 kWh and 277.5 V, a battery charger for 3 kW cooled by water, an inverter, a DC/DC converter as well as a reducer of engine speed. The rest of the technical sheet leaves appear 125 km/h in v-max but 85 km of autonomy.